Avoid foreclosure now. Has your ARM changed to a rate you can’t handle? Have you experienced some sort of financial setback? Are you facing foreclosure in Chicago? Don’t worry – you don’t have to foreclose your house. I have a fast solution to your problem! In this article you will learn how to stop home foreclosure proceedings, how to avoid them and how to get help from the government, including help for veterans. Maybe you’re saying, “I need to sell my house Chicago! Help!” We will closely look at all processes and help you get back on track fast. But let’s look at this first. Foreclosure is an auction which occurs when the homeowner fails to pay the mortgage. When your property can’t be sold at an auction, it becomes a part of the lending institution. If you have a current hardship in paying your mortgage, contact your loan servicer immediately. Federal Deposit Insurance Corporation states that you have to make sure you work directly with your servicer or counseling agency. Offers which are too good to be true are usually a scam. Stay safe and trust only reputable and secure services. You should also carefully analyze your budget – count your expenses and see which spendings you can cut down. U.S department of Housing and Urban Development shows several programs, brought to us by The Obama Administration, which will help you avoid foreclosure. This list includes Making Home Affordable © (MHA) Program. Its strategy is to “help homeowners avoid foreclosure, stabilize the country’s housing market, and improve the nation’s economy.” Companies like Federal Deposit Insurance Corporation also work towards helping you make easy and affordable repayments to your home. Avoid foreclosure and get fast cash for your Chicago house. We can make you a fair cash offer within 24 hours! Consider loan modification, a repayment plan, a reinstatement, forbearance and any other options that fit your situation. If the fourth option seems to work for you, you’re in for some good news. I buy houses fast and for cash. Within 24 hours of filling out the home form you can have a cash offer in your hand. Not only do I pay cash for houses fast, but I can purchase that house from you in just a matter of days! Awesome for you, we buy houses in Chicago. We work fast to get you a no-obligation cash offer for you house within 24 hours. Our house sellers comment all the time about our soft approach. You won’t get a hard sell with us. If you are not completely satisfied with the offer we make to buy your house, you don’t have to accept it. No charge. No fees. We’d love to speak with you today about the house and your situation. We’re here to help even if you decide not to sell your house. If the above options do not fit your situation, you can put your house up for sale, pay off your house loan, and avoid foreclosure Chicago . Selling your house will probably free you of your current financial situation. In some cases, you may even be able to have leftover cash to help you start over again. 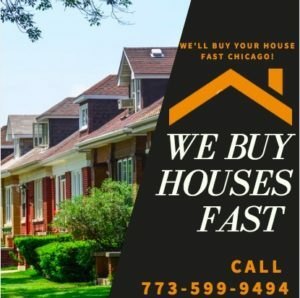 You may be able to stop foreclosure in Chicago by selling your house to a company that will pay you cash and buy it quickly.